As the saying goes, Third time's the charm. 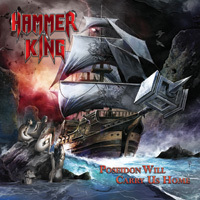 German metal warriors Hammer King are back with their third studio album, Poseidon Will Carry Us Home. As we've come to expect, the long player includes more power metal odes to, what else, their heavy metal hero, the Hammer King. But also glorious tales of war, warriors, a plague, and something called Meatus Majestatis. I'm not sure I want to know what that means. Sounds like a Gwar or Lordi song. Musically, Hammer King also delivers as expected. As with previous albums, the band offers their signature elements: twin guitar harmony with soaring lead solos and vocal arrangements with abundant harmony and melody in choral refrains and gang chants. After this, all things are wrapped up in the proper mix of power metal gallop and hard rock groove. In the end, the songs sound epic, adventurous, and bombastic, and to think it takes only four guys to make it happen. 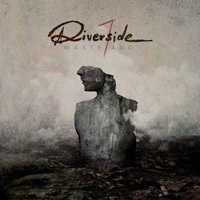 Moving on the songs, the usual suspects are found within Poseidon Will Carry Us Home. Basic power metal comes with Battle Of Wars, Warriors Of Angelhill, and the lightning fast and short, Locust Plague. The Hammer King returns within Where The Hammer Hangs and the quite catchy The King Is A Deadly Machine. But the album offers a first for Hammer King, a nautical trilogy about the Hammer King with the songs, Poseidon Will Carry Us Home, At The Mercy Of The Waves, and the unnecessarily lengthy, We Sail Cape Horn. The only problem is that the songs don't appear together as a trilogy. The first song of the trilogy is the first song on the album. The latter two, however, are paired together later in the album, before the closing song Meatus Majestatis. Is it Meat Majestic? Or Majestic Meat? Obviously corrupted Latin, definitely tongue-in-cheek humor. All said, Poseidon Will Carry Us Home is simply more typical Hammer King offering galloping and bombastic power metal. Recommended. 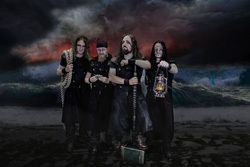 All said, Poseidon Will Carry Us Home is simply more typical Hammer King offering galloping and bombastic power metal. Recommended.